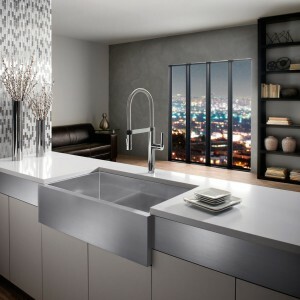 Home chefs with commercial-grade appliances can complete the look with restaurant-style kitchen faucets. These industrial-style fixtures have spouts nearly twice as high as normal faucets to fit tall pots or a large stack of plates underneath. The faucets typically have a detachable sprayer wrapped in a flexible spring coil. While many homeowners are drawn to the faucets’ industrial-look, some balk at their large size, says Tim Maicher, director of marketing at Blanco, a high-end faucet maker. The early models were so large that “the faucet would swing around like a loose fire hose,” says Mr. Maicher. To remedy this, Blanco and other manufacturers introduced slightly smaller versions, with the option of a hidden coil.